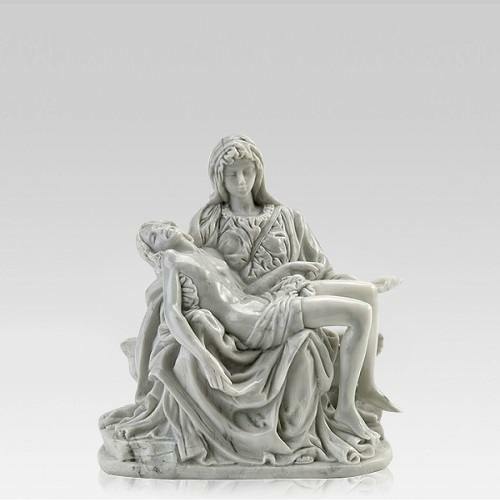 The La Pieta Keepsake Urn is made of cold-cast resin in an elegant design. The hand-painted, marbleized finish adds a touch of old-world grace to this sculptural vessel. This beautiful keepsake urn is perfect for families who are scattering or sharing the remains, and wish to keep a small portion. This keepsake urn will offer a peaceful remembrance of your loved one. 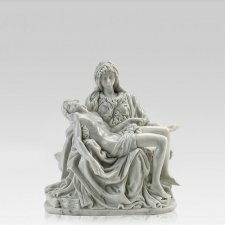 "This is a beautiful urn that looks hand made. The color of mine is more of a grayish green than the bright green of the picture, but in ceramics colors often vary. I have my urn on top of my entertainment center along with other items. It fits in well, and doesn't scream "cremation urn." This urn really is a fitting container for the ashes of a beloved pet."